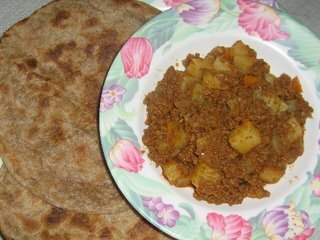 I prepared Indian food for dinner yesterday - Chapati and Keema. Actually mum prepared part of the ingredients for me as I do not have the slightest idea of how to cook Keema. Mum then explained to me the other ingredients that I need to prepare and how to cook them. As for the chapati, I bought them frozen from the supermarket. Just need to heat it up on a non stick pan for a few minutes and it is ready to eat. Thanks mum for the great Keema recipe! Fry onion, garlice and ginger till soft. Add in ground coriander, cumin, ground chilli and tomato sauce and fry till frangrant. Put in diced potatoes and carrot and add in water. When potatoes and carrot are almost soft, add in the precooked minced meat. Put in chicken granules and salt to taste. Mix well.